Review | Almost half of all the cars sold in Europe are compact. Because of increasing oil prices the demand for small cars keeps growing. Yet, Mitsubishi didn't offer a small, frugal city car. That is all to change with the introduction of the "Space Star": a spacious, compact car that is set to conquer the world. "Global Small", then "Mirage" and now "Space Star". 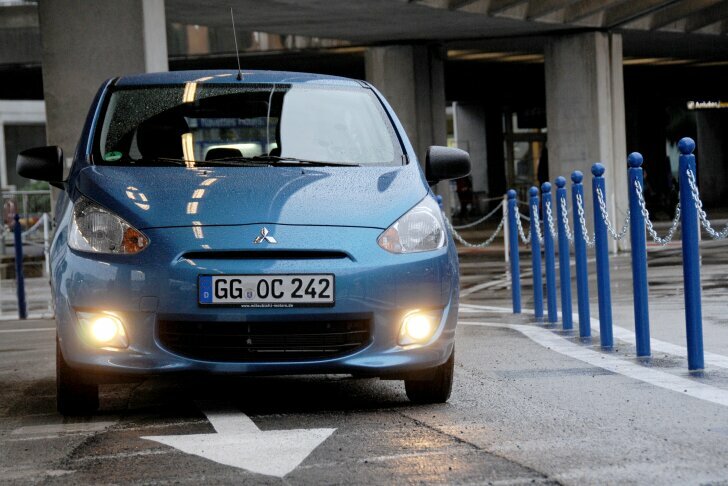 Mitsubishi's smallest model has been known by many names. Despite the other models, this Mitsubishi has been designed from the very start to be sold all over the world. In that way development costs can be spread over a large number of cars, thereby reducing the price of the vehicle. This is why during the development phase the name "Global Small" was used. The name "Mirage" was more catchy, so this is how the new car was to be known all over the world. The car was taken into production, brochures were printed and the marketing department was ready to spread the word. Despite thorough legal preparations, a problem was raised at the very, very last moment. One European company objected to the use of the "Mirage" name. While the car was already on sale outside of Europe (in Thailand some tens of thousands of units have already been sold), Mitsubishi had to come up with a quick solution. The name "Space Star" was recycled. Although this small car isn't an MPV (like the former Space Star), in hindsight it doesn't prove to be an inappropriate name. Over time many small cars have grown so much that they are now mid-sized vehicles. Parking in the tiniest spot is no longer possible and because of the increased weight the fuel consumption has done the same. 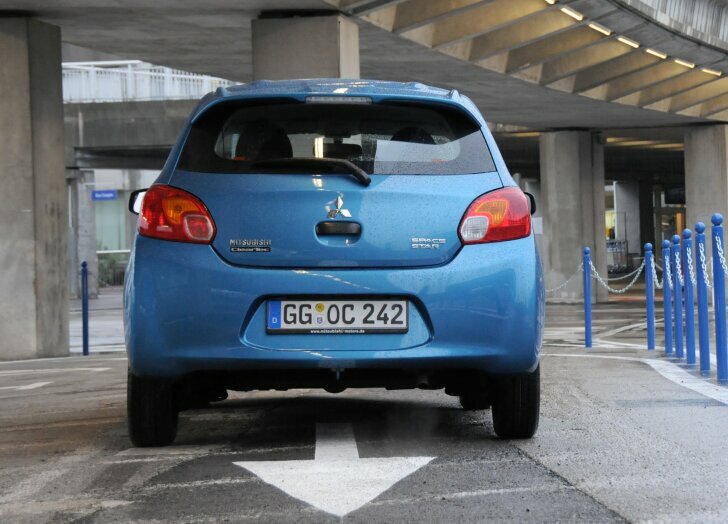 Other compact cars are small for only one reason: to be cheap. With the new Space Star, Mitsubishi wants to fill the gap between the smallest, cheapest car on the market and those that have outgrown the segment. Immediately after taking place behind the steering wheel, it turns out Mitsubishi has succeeded in its goal. Not only is there ample head and legroom, the space around the front seats is excellent as well. This gives the pleasant feeling that the Space Star is much more than a little budget car. Take a seat in the back and the Space Star definitely convinces. Both head and legroom in the rear is above average. Even with two adults in the front, there's space for two more on the back seat. The room in the rear doesn't go at the expense of the boot, it is spacious as well. Both the design and build quality of the cabin is immaculate. There's no bare metal inside and all materials feel solid. The specs also prove the Space Star is a compact yet mature car. For example, a foldable back seat, six airbags, ESP and power windows come as standard. The optional air conditioning is almost mandatory because the windows mist up very easily without it. For this test the most luxurious version was driven. This means heated seats, satnav, a reverse parking camera and keyless entry are all standard. The latter two seem to be an afterthought. Both the button on the door for the keyless entry and the camera on the boot lid stand out like zits on the bodywork. The satnav stands out in a positive way: it is easy to use and the instructions are easy to follow. Integration with an iPhone and iPod is also available. While the Space Star offers the room and trim level of a B-segment car, it drives like an A-segment vehicle. 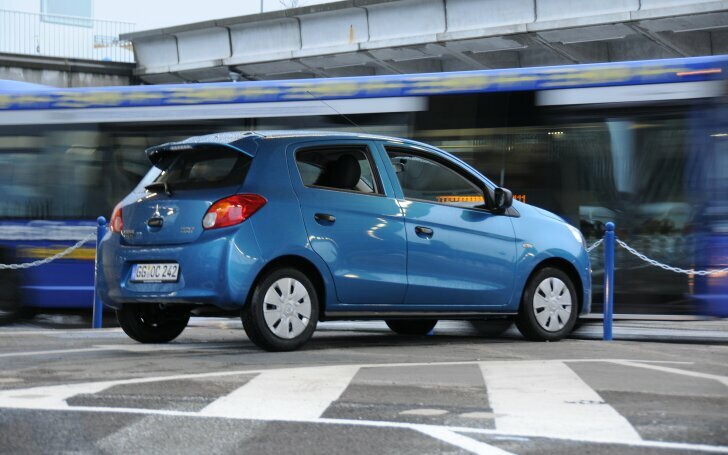 The Space Star is larger than the smallest cars on the market, yet it is as manoeuvrable. Steering is light and almost devoid of any feeling, but that isn't completely unpleasant in heavy (city) traffic. On the open road the Space Star is less convincing. In high speed corners the car tilts too much. In sharp bends the front wheels easily lose grip ("understeer"). The electronic stability programme ("ESP") corrects this effectively, but it would be better if good suspension prevented it in the first place. When it comes to performance the Space Star outperforms all its competitors. That is: after some getting used to. The first few kilometers with the Space Star were awkward, to say the least. The clutch has a lot of play and the accelerator reacts indirectly. Therefore, the optional "CVT" (Continues Variable Transmission) is a serious alternative. It makes shifting gears unnecessary, while improving both comfort and efficiency levels. Once used to the clutch and accelerator, the Space Star pleases with excellent performance. For example: merging on a busy highway is easier than with any of its competitors. Yet, the engines have been designed with efficiency in mind. The Space Star comes with either a 1.0 of 1.2 litre petrol engine. Both have three cylinders, which means less moving parts and the best possible combination of fair performance and high efficiency. A drawback of the three-cylinder engine (four-cylinder is more usual) is its rough sound and shaking of the engine. Mitsubishi didn't manage to muffle the noise. From the very first moment all occupants know and feel this is a three-cylinder car. It's not only the engine, the tyres and wind are also clearly audible at higher speeds. To help the driver to save fuel, next to the speedometer a large "eco-meter" can be found. Green and orange blocks indicate how efficiently of inefficiently the driver is doing. Expect 6 litres per 100 km or 5 litres per 100 km with a very calm driving style. That is a lot more than the brochure promises. This means that in daily life the Space Star isn't more frugal than other small cars. As stated before, performance is better and that's where the Space Star scores. This isn't only thanks to the design of the engines, but also because of the low weight of the car. Every pound that doesn't have to be moved also doesn't take any energy. On average the Space Star is as much as 100 kg lighter than its rivals and that makes all the difference. Its was not looks, but its efficiency that was paramount when designing the Space Star. The Space Star has been "drawn" by the wind tunnel rather than by a creative mind. For example: the front is slightly wider than the rear to give the car an ideal teardrop shape. The huge rear spoiler reduces drag behind the car, which also improves handling. Small, affordable cars are more popular than ever before. Not only in Europe, but all over the world. 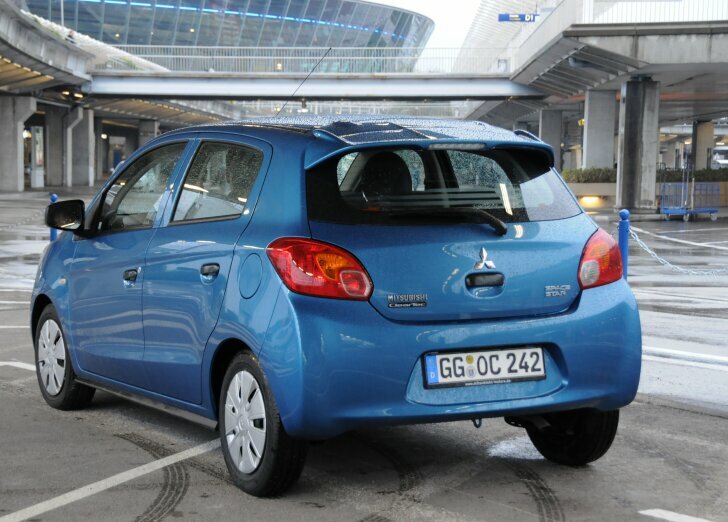 That is why Mitsubishi now introduces the "Space Star". It isn't just aimed at the European market, but will be sold worldwide. In that way costs can be cut. The Space Star distinguishes itself from its rivals by its smart design. 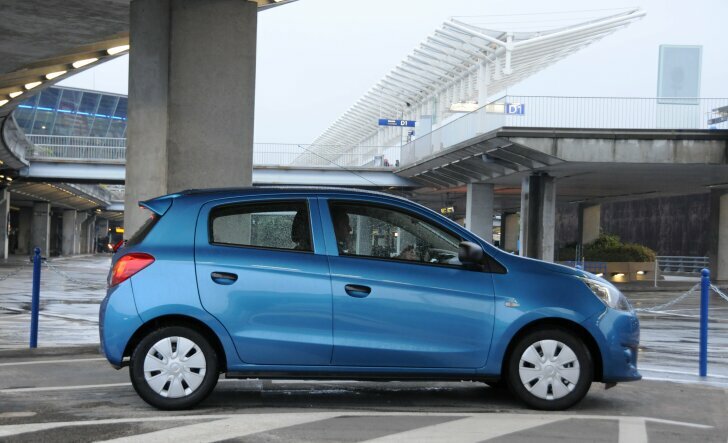 The Space Star is slightly roomier than the smallest cars on the market, yet it is still so small that it is highly manoeuvrable and easy to park. Thanks to its high build quality and standard equipment the Space Star feels like a mature compact car, not a cheap little car. Handling is that of a cheap car: the Space Star tilts over in corners and it is downright noisy at high speeds. The Space Star isn't as frugal as Mitsubishi promises; during the test drive it used the same amount of fuel as most other compact cars. On the other hand: the Space Star did perform much better and might just be the ticket to conquer the world.